Bespoke Door Installations offer made-to-measure fitted replacement front doors from just £630! Whether you’re looking for a new front door for your home, or are looking for a stylish and modern replacement front door, we have a fantastic selection for you to choose from. If you’re in the market for a replacement front door, then a composite door is definitely the solution. Design your own replacement front door using our bespoke composite door builder below, and choose from 1000’s of design options. We are one of the leading suppliers and installers of replacement front doors in the East Midlands region. All of the replacement front doors that we supply are built to last, and come with a 10-year guarantee. Design your own bespoke replacement front door using our design online tool below. Replacement Front Doors From Just £630! Choose from 1000’s of design options and have your replacement door fitted from only £630! The price you see at the end of the door designer includes your installation quote, so what you see is what you pay, no hidden fees. Statistics show when it comes to burglaries in the UK, front doors are the main source of access. Therefore, front doors need to be made to be as secure and strong as possible. When you design and order your new replacement front door door from us, your new front door will be secured by design. 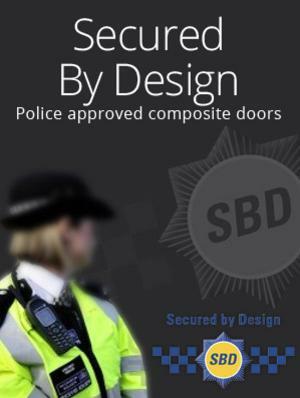 Secured by Design is an upgrade that meets the national standard for safer homes. It’s not only recognised by many insurance companies – potentially lowering the cost of your home insurance – but is also Police-approved. All of the replacement front doors we offer undergo severe brute force attacks. The doors are attacked with crowbars, sledgehammers, credit cards, and other known tools to break into homes through the front door. We then test the doors with a 30kg ball by swinging it into nine different places on the door. We do this to check the doors will withstand a shoulder barge. All our doors must withstand a total of 30 minutes of relentless attacks to pass the PAS 24 test. 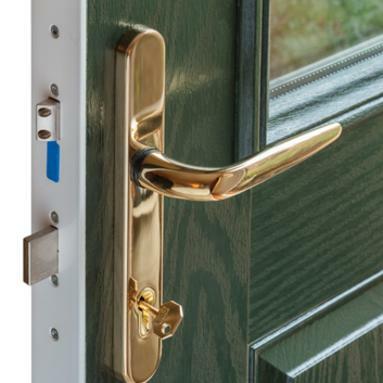 Read why composite doors are better than uPVC front doors here.